Our elf Patraj is back---- totally weird name, I know! Started off as a joke and then stuck. To herald his return (and the return of me saying 'well you'd better do this now or Patraj will tell Santa'), we had our annual North Pole Breakfast-- We usually do it on the first of December with a couple small presents from our elf and a sugar filled breakfast…. usually it's chocolate chip pancakes, the go-to celebratory breakfast around here. However, as I had just come back from NYC and because it was a Monday morning and I drag myself off the bed most Mondays, we totally cheated and got yummy scones from a bakery. A variety of floury, sugary treats on a Monday morning…. life is sweet (literally)! Somebody went to town on the gingerbread scone. And then began to open presents… just some clothes and a headband I had brought from NYC. Initially, I had planned to give them their christmas pjs but Miss Nosy here decided to go into my luggage and found said pajamas. A came but really just wanted milk-- sidenote, we think she might be a touch lactose intolerant but she drinks milk like it's her job--- eeek! 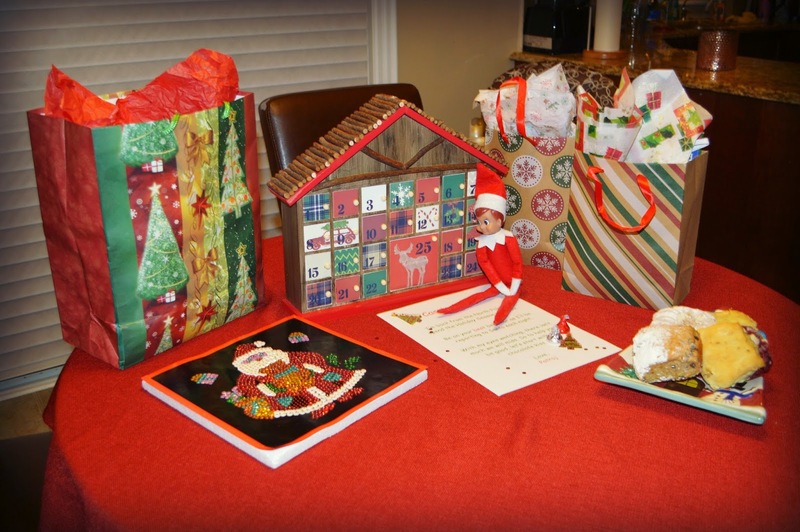 So anyways, our elf is around and I have to get creative every night… but not as creative as those pinterest posts! I forget sometimes and then have to make an excuse. But it's such a fun tradition and I know it's for such a fleeting time as in the next few years, they will start to wise up. This year however, C is getting into it more and more so I'm making a special effort! I might need to tie a string around my finger or something. with Jess and Ashley for It's The Little Things. Adorable! We've introduced our elf this year but G is still too little to understand. She does love looking at her though. So cute!!! 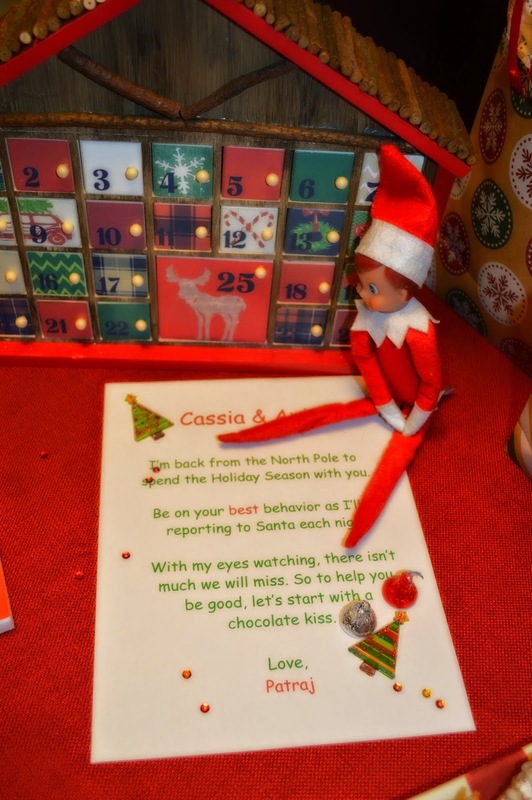 I love seeing all the ideas on pinterest of how the Elf just gets into trouble!! Glad your girls enjoy it!! This is too cute!! I can't wait until Hallie is old enough to appreciate our elf, Jovie! Love this!! I love the idea of a North Pole breakfast. Our elf hasn't show up quite yet...thinking a Saturday morning breakfast might be a good arrival time ;) We started our advent calendar too! Blessings, sweet friends! 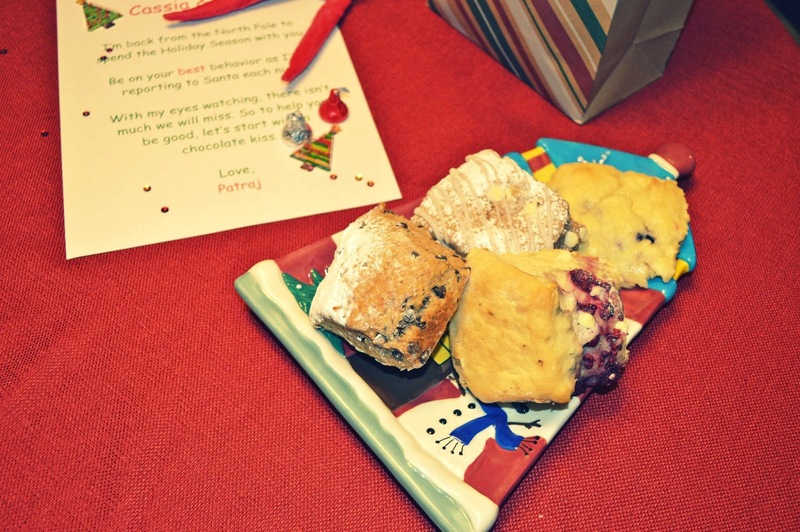 Love the north pole breakfast + presents! And so clever that C recognized the stickers. Aaaahhh I love the North Pole Breakfast arrival. That is so much fun. I think I may try and have Bob arrive that way next year. Scones... mmmmmm!!! I LOVE scones, those look amazing.